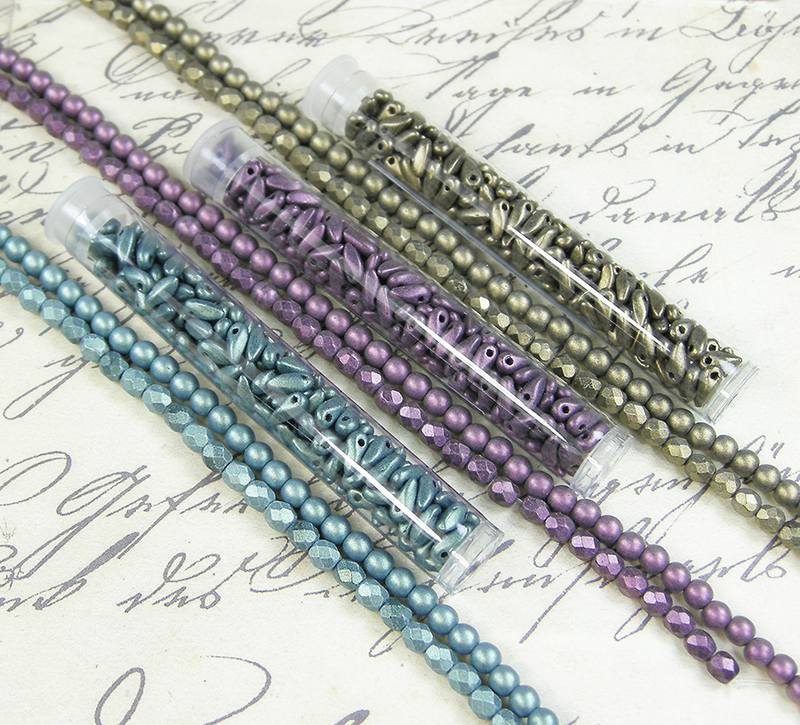 It was the blue that really caught my attention as I was looking through our selection of Metallic Suede beads. What a great color! And of course I realized right away how perfect they would look with copper. 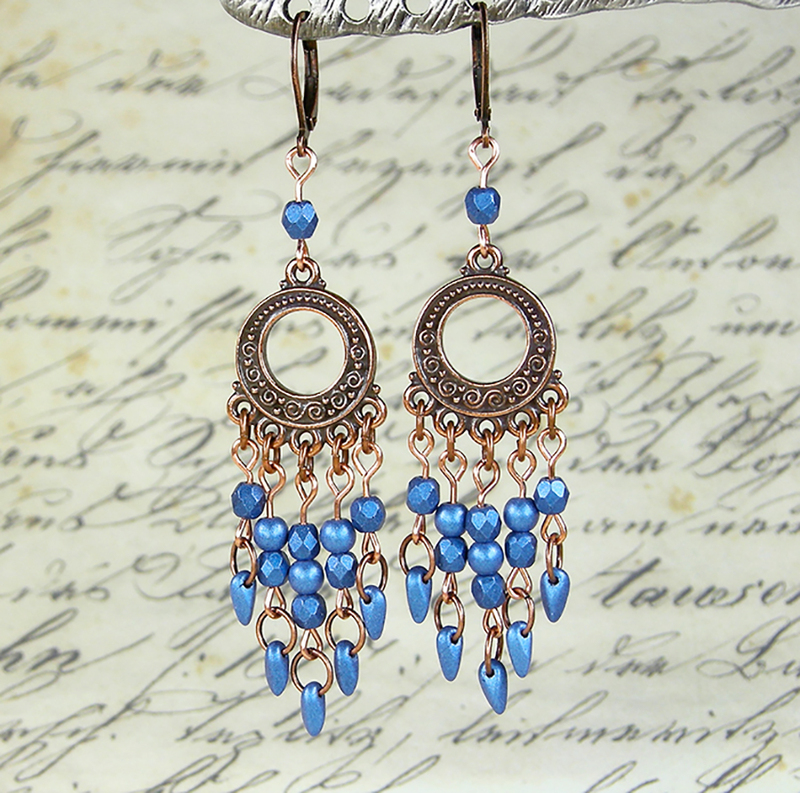 One of the great things about these earrings is that everyone gets to choose! You can use an entirely different set of colors to work with, or mix and match your Metallic Suede beads to suit your liking. In terms of the Metallic Suede beads, these earrings use three different kinds of beads: 4mm Firepolish, 4mm Round and the Mini Dagger. We have all three of these beads, in three different yet matching Metallic Suede finishes (in addition to the blue): Gold, Light Green and Pink. Another option is to make these earrings in silver or gold. You could also use the Bali Link instead of the Spirals and Beads Link which are very similar. Make ten round jump-rings using 22GA parawire. Gather ten of your eye pins. Add beads per instructions below and finish with a simple loop at the top. To four eye pins add one firepolish bead each. To four eye pins add one firepolish bead and one round bead each. To two eye pins add one firepolish bead, one round bead and one more firepolish bead. To the hand made round jumpring add one mini dagger and one eye pin with beads. Attach the other end of the eye pin to the link with a small oval jump ring in the pattern shown above. Repeat until all eye pins are attached to the link. Take two more eye pins, add one firepolish bead each and finish with a simple loop at the top. Attach this to the top link on one end and the earwire on the other end.